If there is a lockdown deck in Cardfight, Murakumo is it. As the successors to the Nubatama ninjas, Murakumo plays similarly; the clan's specialties are denying the opponent advantages, canceling their skills and forcing them to make bad moves, and this is why they remain so relevant in a game that is largely based around jousting across the field with the vanguard. The vanguard line is the only line that cannot be predicted in a typical game, it is where all surprises originate from, and Murakumo is determined to stop it from making those surprises happen. BT05: Awakening of Twin Blades brings the deck its basic setup, with Stealth Beast Evil Ferret as the clan's base 5000 first vanguard. In addition to outriding from the soul, Ferret's skill is to put itself on the bottom of the deck and then call a Murakumo unit from your hand to the field. In the end phase, that unit will then return to the hand. This doesn't sound like much at first since it returns your net advantage to 0, but the skill is most powerful when taking the second turn--Ferret can superior call a grade 2 or 3 unit while you are at grade 1, allowing for a better offensive. This plays into the clan's enforced stand trigger. BT05 only gives Murakumo one heal, one draw, one critical and one stand trigger, so it's best to always have something to attack with prior to the vanguard attack in case of a stand check. More than this though, Ferret gives early access to Stealth Dragon Cursed Breath's skill for a combo play. Cursed Breath is a base 8000 grade 2, so while he's wholly reliant on a base 8000 booster to form even a 16000 power line, his skill is very complementary to his low power. When Cursed Breath's attack hits the vanguard, he can look at up to five cards from the top of the deck for the grade 3 Covert Demonic Dragon Mandala Lord, add it to the hand, and then place the remaining cards on the bottom of the deck. As with Tsukuyomi, you can use these kinds of skills to gradually build up a stack of triggers on the bottom of the deck and then draw-drive into them, while also bringing added grade security to the table and getting you back the +1 that you lost when Evil Ferret went to the bottom of the deck. Since the skill is on-hit, it can be repeated multiple times throughout the game to build up that stack much faster than Tsukuyomi can, having an 8-10 card stack after two attacks and 12-15 after three. Cursed Breath's power is also equal to the highest possible base power for a grade 1, which helps push for a strong offensive when taking the second turn. Another way to exploit Ferret's skill is with the grades 1 and 2 units Stealth Beast Million Rat and Stealth Fiend Midnight Crow. Rat and Crow are base 6000 and base 8000 units that can counterblast 1 when they are called or ridden to superior call a copy of themselves from the deck, then place it at the bottom of the deck. Even if your hand has a lot trigger units in it and not a very good offense, these cards let you dip right into the deck and pull that offensive out of your hat, and when you do have that offense ready you get to conserve it for more important stages of the game, attacking without dedicating your hand. This keeps the field open for other units later on while controlling what targets retire-based clans like Kagerou or Narukami have access to. And when you superior call a Rat, you can counterblast again to superior call another with that Rat's skill, filling your entire back line with just one call and a counterblast 2. The tricky part of these skills is that they force the deck to be shuffled after they search for the copy unit, which interrupts the stack that you began building with Cursed Breath on the previous turn, but this is not necessarily a bad thing because now Evil Ferret's 10000 shield is no longer at the bottom of the deck and when you draw into him you will have 10000 more shield than most opponents prepare for. Like Blade Seed Squire, Murakumo decks have a very subtle defensive advantage that have small but still significant differences in play from their contemporaries. Stealth Dragon, Turbulent Edge is the grade 1 equivalent to Cursed Breath, but as a base 6000 unit is hard to recommend because his attack will hit so rarely and because Murakumo does not yet have a Valkyrie Laurel copy to form 18000 power lines with. Instead you should consider Stealth Beast Leaf Raccoon to fill out your grade 1 slots along with the base 8000 Shijimamaru. 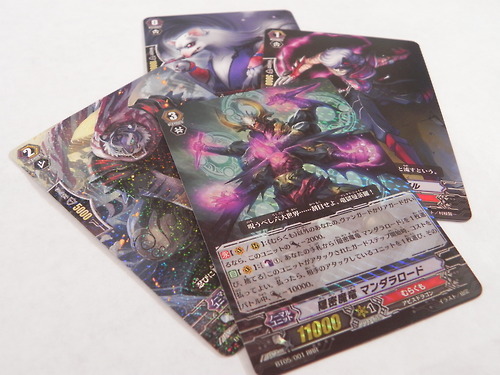 Raccoon is a base 6000 unit like Turbulent Edge, but when he boosts a Murakumo vanguard and you have more cards in hand than the opponent, the vanguard gets +4000 extra power for a 10000-power boost overall. With Million Rat and Cursed Breath playing into keeping your hand size high, Raccoon is like an advanced Milk that make an 18-21000 power line very quickly and easily. His skill sees a lot of support from cards which add to or conserve the hand, and cards which decrease the opponent's; while Murakumo does not have a whole lot for the latter, it does have Stealth Beast White Mane, a base 9000 grade 2 that can unflip 1 damage when his attack hits the vanguard. In other words, a Murakumo print of Electromagnetic Lifeform, creating a rift in card advantage by drawing the opponent's defense out to keep you from unflipping. On increasing the hand, Caped Stealth Rogue Shanaou also plays for the hit-and-run side of things like Midnight Crow, by returning to the hand when his attack hits. Shanaou's base 8000 is difficult to recommend however, because the deck already has so many of those running around at grade 2 and there are more coming out of future sets. The clan's boss card on-release is the very Mandala Lord that Turbulent Edge and Cursed Breath have been searching for. Mandala comes with an 11000 base and brings into play the first of many lock skills. When the opponent attacks Mandala Lord, you can counterblast 1 and persona blast a copy of him to decrease the power of the attacking unit by -10000 power. The key behind the persona blast is that it effectively lets you run one more 10000-shield unit for each non-vanguard copy of Mandala Lord in your deck than normal, without having to actually give up the grade security that is this strategy entails for other decks (in fact, Cursed Breath increases the security by giving you extra chances to add Mandala Lord to your hand.) This plays back into the extra shield that Evil Ferret puts into your deck; Evil Ferret and your three Mandala Lords together total 40000 extra shield that you can access, giving defensive play tremendous weight and letting you guard for two triggers or pull off no-pass plays very late in a match. These Mandala Lord copies that would otherwise become dead weight and be relegated to paying perfect defense costs can leave any attacking column with less than 21000 power one intercept away from needing two triggers to pass. Supplementary to the Covert Demonic Dragon is the Stealth Field, Kurama Lord. Kurama Lord is a base 10000 grade 3, and the clan megablaster; each turn he soulcharges 1 and unflips one damage for the reuse of counterblast, and when his attack hits in either the vanguard or rearguard circles he can counterblast 5 and soulblast 8 to stand all of your units, including himself. This is a direct repurposing of Mr. Invincible for Murakumo, and Murakumo runs into a lot of the same difficulties. The clan is lacking in soul support, Evil Ferret has no way to return to the soul, and there are no soulcharging units other than Kurama Lord himself, which makes the megablast slow and cumbersome to both build off and activate. So while you'll likely never see the +2 from his megablast's extra twin drive, you can make full use of his unflipping abilities, getting more use out of Million Rat or Midnight Crow, and dedicating the minimum amount of hand to the field necessary until you can stall into Mandala Lord. The Murakumo clan prides itself on guerrilla tactics and interrupting the opponent's strategy, two elements that Extra Booster 1 and Booster Set 9 will expand on greatly. However, at their international release they are missing elements definitive of the clan's original vision; March will see us revisiting this clan to discuss that vision and how they were designed to fit within the greater framework of Nubatama. News: The Stand Up Challenge Cup 2013 Begins!